Last month, we looked at the U.S. mobile ad revenue forecast, drilling down on search’s growth and dominance among ad formats (i.e. search, display, SMS, video). Another important breakdown is the portion of ad dollars going towards location targeted ads. First, to recap, the overall mobile ad market is projected to grow from $1.7 billion to almost $8 billion by 2016. These figures are up slightly from the last forecast, due to updated market analysis and things like Google’s global mobile run rate. Because of Google’s 95 percent share of mobile search, its disclosures are useful in extrapolating the entire market. Drilling down, location targeted ads now represent under half of mobile ad dollars, growing to almost 2/3 by 2016. This measures mobile ads (all formats) shown based on someone’s location, geo-modified search term, or those that have geographically relevant ad copy or calls to action. This definition will continue to evolve. Usage: Mobile local search is on the rise. Google reports that 40 percent of mobile searches have local intent, up from 33 percent 18 months ago. Mobile local ad network xAd meanwhile reports 117 percent year-over-year growth in mobile local search volume. Advertiser Evolution: Advertisers are starting to take this reality to heart by building mobile-only campaigns that utilize location targeting (rather than port existing campaigns to smaller screen). Millennial Media reports that location targeting in mobile ads is up 53 percent year-over-year. Premium Ad Rates: The above factors will create increased ad volume. But in parallel, premiums on locally targeted mobile advertising will boost the dollar growth. Those premiums will result from higher performing location targeted ads, such as CTRs and other metrics reported to us by mobile local ad networks. As we examined in the last column, mobile local searches, from both browsers and apps, are on pace to surpass desktop local searches in 2015. Looking deeper, it’s clear that this is a function of increasing mobile searches per user (again, 40 percent of which are local). It also results from total search users, which account for 44 percent of U.S. mobile subscribers, growing to 75 percent by 2016. That’s about 225 million people. Advertiser demand is catching up, but not as quickly as supply (such as mobile local search volume) is growing. Premium ad rates aren’t yet materializing, due to laggard advertiser adoption. This has kept prices like CPCs and CPMs down (for now). As a side-note, because location targeted mobile ads haven’t lived up to the value that’s commensurate with their performance, there’s undervalued ad inventory out there. Buried in that finding is the comment that now is a good time to experiment with mobile local advertising, especially in search. But the larger point is that the relevance and higher performance of location targeted mobile ads, in both search and display, will be required to prevent the commoditization of ads that we’ve seen on the desktop over the last decade. This has been more pronounced in display than in search. 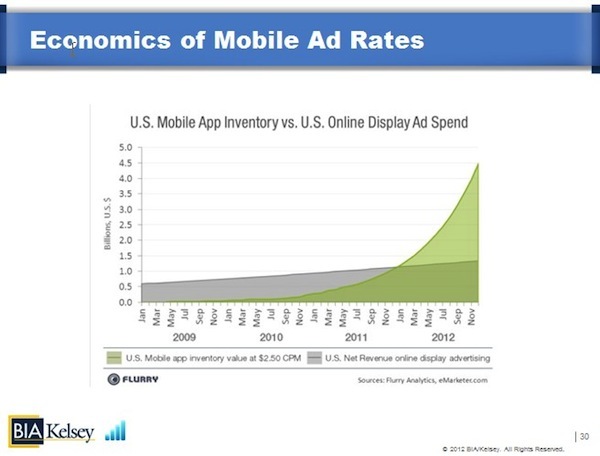 This is important because we’re starting to see that same oversupply of ad inventory happen in mobile. This is causing ad rates — such as average display CPMs – go down where they now hover around $2.50 on average. More depth on these economics can be read here. There are a few ways to avoid these sinking mobile ad rates though. One is for demand to catch up with supply, for which we see some evidence. Another is to establish more premium sources of ad inventory. And that’s where location targeting comes in. There are a few emerging forms of mobile engagement that could house premium advertising. They include earned or achievement-based advertising (like kiip), or organically generated social advertising. For the latter pay close attention to what Facebook is beginning to roll out with mobile sponsored stories. But most of all, location targeting could create the degrees of relevance necessary to boost ad performance and engagement – and thus premium advertising. The former (performance) is something we’ve already seen play out, while the latter (premiums) are only beginning to be seen. Just give it time.